Are you in the vicinity of Milwaukee, Wisconsin? 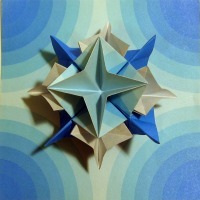 Check out these free origami workshops! Or, explore our classes or custom workshops and parties. 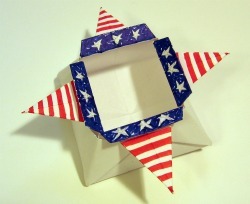 Sit down with Barb and Make-and-Take a free origami project. 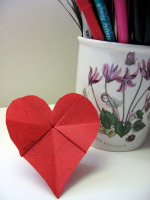 Surprise someone special by secretly placing an origami heart on their desk or bedside table. ALL 50 of us! Thanks, Barb!" Coming next: ...to be announced! Did you miss my previous Make-It and Take-Its? 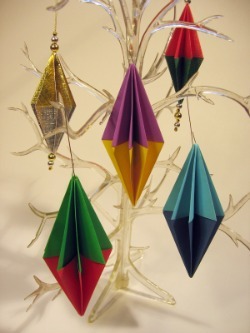 All About Origami provides customized origami workshops and parties for individuals and a wide range of organizations including schools, libraries, hospitals, retreats, and clubs. Fees include all materials, and vary depending on your particular requests and group size. Larger groups or elsewhere in Wisconsin: $250. We provide two instructors for larger groups. Each 1- to 3-hour workshop is custom designed for you and set up at a time and place that's convenient for you. Or, join one of Barb's regular classes where fees are as low as $10 per person. 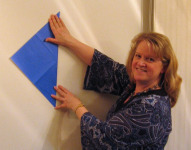 If you prefer, you can get a small group together and come to Barb's studio in Menomonee Falls, or to her family home in Hancock, WI. Workshops can be geared to kids, adults, or a mix. 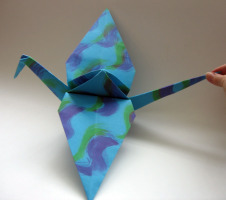 Attention parents and teachers: Origami is a wonderful tool for developing learning skills in children and making math fun. Our methods are influenced by two innovative and highly successful programs: "Origametria" used in Israel, and on InCreasing Math, part of the Dramatic Results program in California. To get started, simply click here for our contact form and let us know the phone number you want Barb to use to contact you. She will give you a call to discuss ideas for your custom workshop or party, or provide you with information about scheduled workshops.